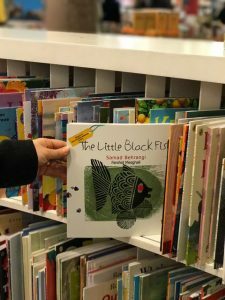 The Little Black Fish (Mâhî-yi Siyâh-i Kûçûlû) tells the tale of a little black fish who wants to explore what is beyond his stream, but his mother and the other fish underestimate this ‘silly child’s dreams’. 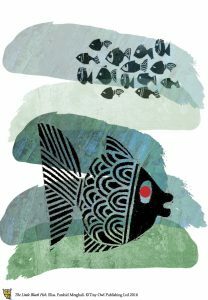 Being different makes the little black fish a ‘stranger’ in his homeland and in the places he visits. However, following his ‘own ideas’ opens him to a sea of opportunities. 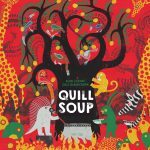 The story presents the power relations between the child and adult; the weak and strong. 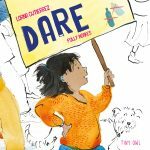 It is a thought-provoking and engrossing tale told by grandmother fish to her 12000 grandchildren, opening doors for its young readers – especially from the age of seven – to wonder about. The story has been enriched with beautiful and wonderful illustrations by Farshid Mesghali, who won the Hans Christian Andersen award for illustration in 1974. Considering the violence expressed against different ethnic groups within societies in the wider world, the message of this book is important for the peaceful coexistence of today’s diverse world as it not only encourages autonomy and chasing dreams, but also respect and tolerance for others. That was why the book was banned in pre-revolutionary Iran. Samad Behrangi was an Azeri teacher born in Tabriz who taught in different villages across the Azeri region of Iran. He collected folk tales and wrote tales for children in Azeri Turkish and Persian. Because publishing in Azeri Turkish was banned in Iran, he published his books in Persian (Ertan, 2011). He was known as an opponent of the Shah’s regime (Hanson, 1983; Fischer, 1990). He was a kind of little black fish. At the age of 29 years his lifeless body was found next to the Aras River. As well as The Little Black Fish, his other tale about the bravery of children One Peach and a Thousand Peaches (Yek Holû Hezâr Holû) is loved by children in Turkey. 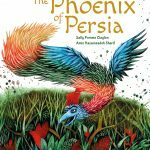 Azita Rassi’s successful translation has been shortlisted for the Marsh Award for Children’s Literature in Translation. 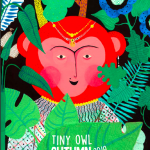 Tiny Owl aims ‘to introduce the cream of the crop of global children’s literature’ and they seem on the way to achieving this goal, starting with beautifully illustrated Persian children’s books. Ertan, G.G. (2011) Samed-i Behrengî’s Storytelling and his Place in Persian Children’s Literature. Selcuk University Social Sciences Institute Journal, vol. 26. Fischer, M.M. (1990) Debating Muslims: Cultural Dialogues in Postmodernity and Tradition. Madison, WI: University of Wisconsin Press. Hanson, B. (1983) The ‘Westoxication’ of Iran: Depictions and Reactions of Behrangi, Āl-e Ahmad, and Shari ati. International Journal of Middle East Studies, vol. 15, no. 01 (pp.1-23). Osman Coban is a PhD student at the University of Glasgow. A wonderful gallery of this book in the Guardian. An introduction by David Almond in the Guardian. The Little Black Fish selected among the best children’s books of the year by the Guardian. 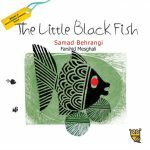 The Little Black Fish was shortlisted for the Marsh Award.